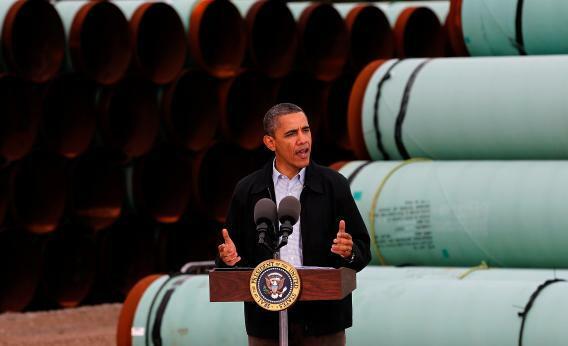 Keystone XL: Nebraska governor Heineman approves pipeline route. U.S. President Barack Obama speaks at the southern site of the Keystone XL pipeline on March 22, 2012 in Cushing, Oklahoma. On Monday, President Obama made climate change a focus of his second inaugural address. On Tuesday, he was confronted with news that could help prompt a showdown over what is likely to be one of the most controversial environmental issues of his second term: approval of a massive Canada-to-Texas oil pipeline. The news is that Nebraska Gov. Dave Heineman has approved a revised route for the Keystone XL pipeline through his state. That removes one of the main obstacles Obama cited in delaying the project a year ago. Landowners in Nebraska have worried that the pipeline could contaminate the Ogallala aquifer, an important groundwater source. The new route is designed to bypass the most sensitive areas. There’s little doubt the Keystone XL project would create short-term jobs and bolster the flow of oil to the United States. On the flipside, it would mean greater U.S. reliance on oil from Canada’s tar sands, one of the most environmentally destructive forms of fossil fuel, at a time when Obama is telling the American people that we owe it to our grandchildren and God alike to tackle the threat of climate change. In 2011, Republicans sensed an advantage in the jobs-vs.-climate-change struggle but overplayed their hand by forcing Obama to make a quick decision on pipeline approval. Instead he instructed the State Department to seek a new route, citing the opposition from Nebraska’s own Republican governor, among others. Now that Nebraska is on board, the choice becomes more stark. Reject the project purely on climate-change grounds and Obama will be pilloried by the right as an environmental extremist, sacrificing the economy at the altar of environmentalism. Approve it and his strong words on climate change will ring empty once again to his supporters on the left.